A touch of minimalist and a wee bit more than bare bones. I hope you’re not expecting a mini list like Gerard’s. I tend to over pack and then unpack. It’s more of an OCD routine I torture myself with. So far I’ve unpacked more than packed so I’m in good shape — that extra sweater, denim and a pair of flats. Lighten the toiletry (shampoo, conditioner and sunscreen) because we can buy those abroad — stuff like that. I already released a snippet of my packing list about a month ago — a girl’s guide for travel must-have and essentials for on-the-go. I can tell you, after just two weeks on the road, I now have a new favorite list of must-haves. But you’re going to have to wait a bit longer for that list. So here it goes, my complete packing list! 50/50. Gerard already mentioned I’ll be carrying the toiletry and medicine for the both of us. I forgot it’s an extended trip so it’s more like 60/40 with all the extra meds I’ll have to bring. Might have to throw a pair of shoes in G’s pack to even it out. 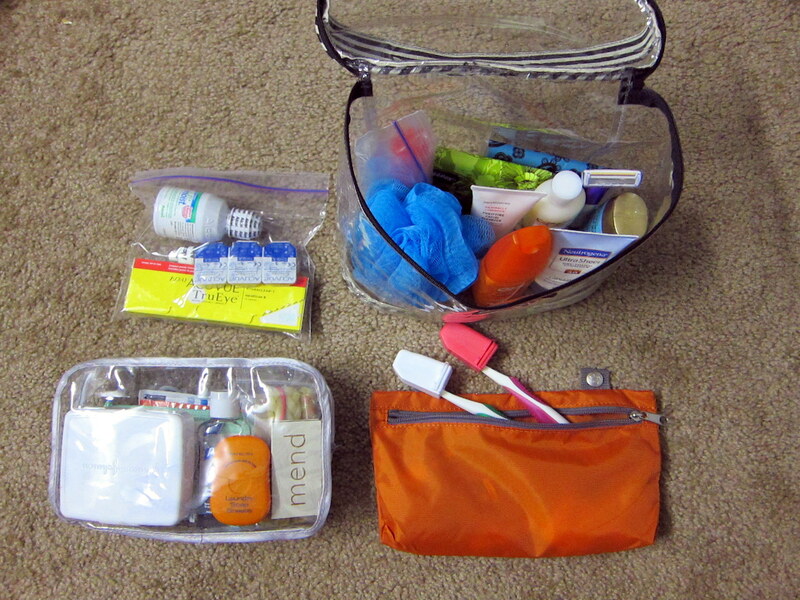 Everything you see above and listed below fits in my large, clear toiletry bag (top right image). It’s perfect for airport security and I’ve yet to have any trouble. I know what you’re thinking, no straightener or blow dryer?! Yes, crazy I know. I’m shocked at the decision myself but I figured, with my track record, I’ll either break it or fry it within the first week. Happened in Vietnam and twice in Europe. No guarantees. But, I figured I can always buy a cheap one abroad. And since we’re spending more time in one place, I have no qualms leaving the hair tools behind once we leave. All of which fits in my REI shower kit. And there you have it. My life in a carry-on for the next 8 months. It may look like a long list but most are small (carry-on size remember?) and shared between Gerard and I. Total weight including the pack itself (which weighs 3 lbs by the way) is 20 lbs! My eBag all packed up! Do we look ready to take on 8 months on the road? I probably over-packed but I can always throw as I go. Did I forget something? All of that for only 20lbs. Good job! 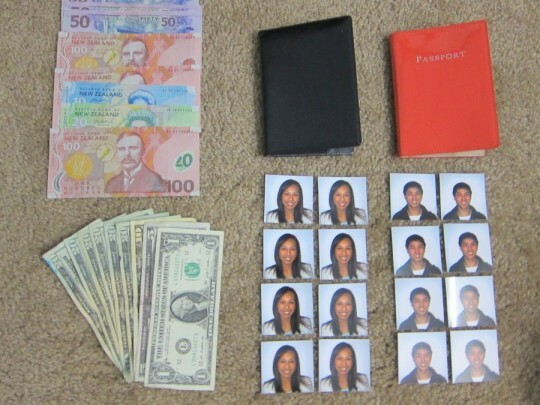 Oh, and on the additional stuff to bring, it would be a good idea to get a laminated color copy of your passport with you at all times. You can show this in place of your passport without having to worry about losing the original. You’ll never have to worry about falling prey to those passport scams! Salonpas and Birthcontrol! 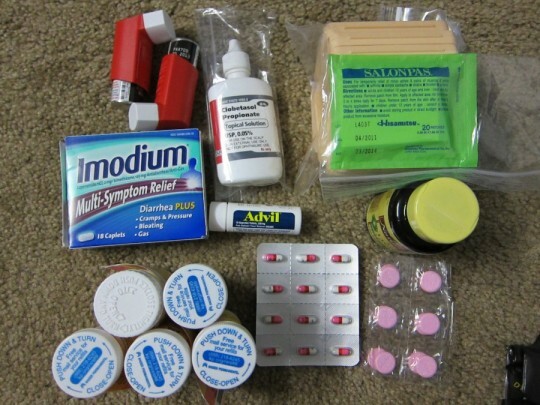 That’s all that’s in my med kit…. 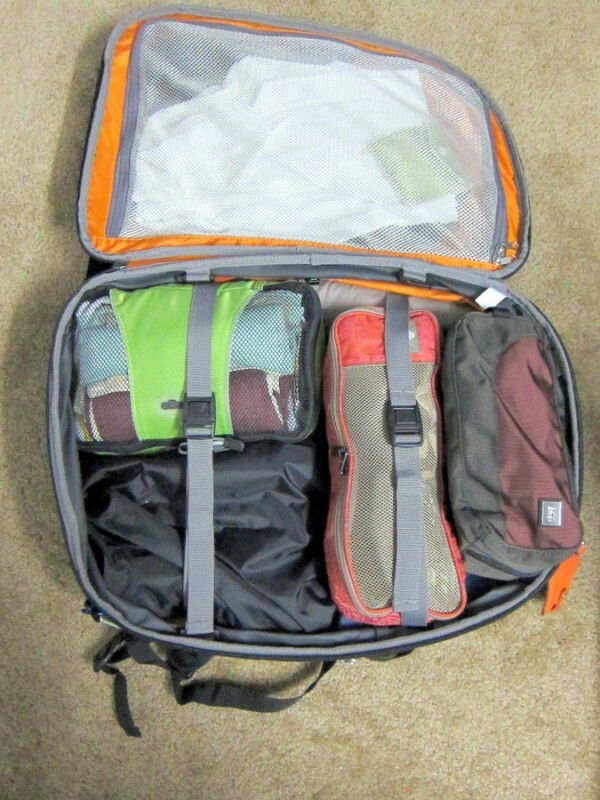 Looking forward to your new and improved packing list! I can’t wait to work on that list. I’m surprised at some of the things I now can’t live without. Completely different than my original list before our round-the-world trip. Thanks for trippin’ by! Nice! What brand(s) are those convertible cargo pants? 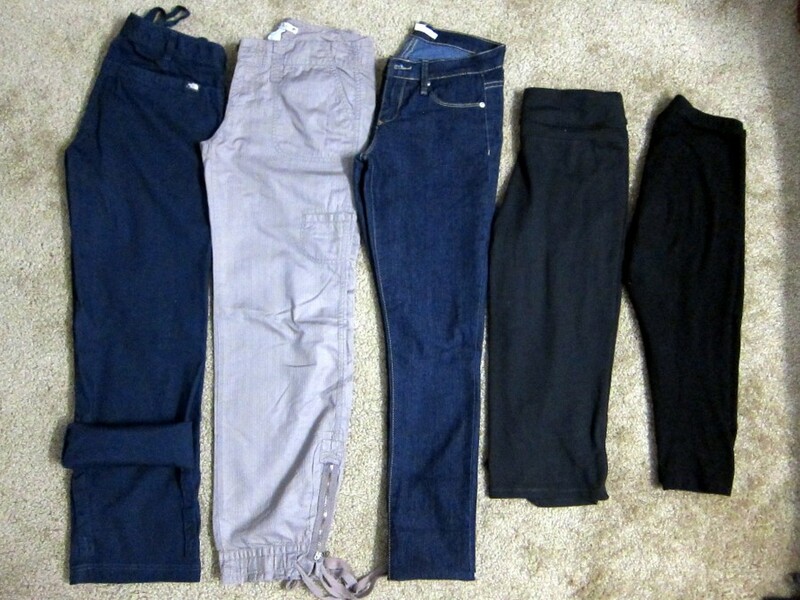 I’m looking for a good pair to bring! Wow! I’m amazed at what you were able to fit in that small bag. I don’t know how I’m going to pack my life in one suitcase, and I still have 2 months to go. I’m using the motherlode TLS mini. I love ebags suitcases. btw. 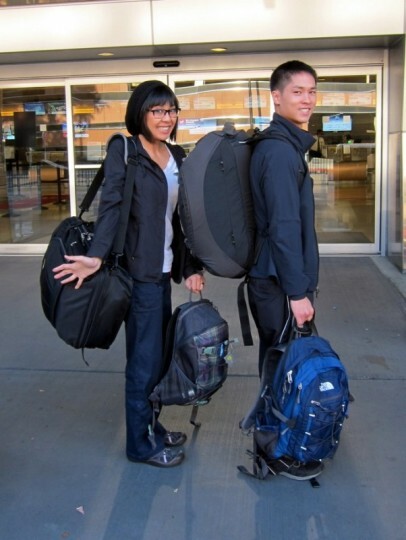 You both look so cute with your luggage. Hope you’re having fun! Doing some early morning research on traveling. THANK YOU for all the tips! Be safe and happy adventures you two! Too bad Gerard already lost your toiletry bag! Good work, G! Hey RUBY!! Ah yes, Ilha Grande. Lol. I remember. Your Osprey had wheels? Cool! I think we opted out of the wheels for more space. Thanks for the tip on the flat iron!! My mini Chi made it through South America but it was never hot enough. Did you have the same problem with yours? I so admire you for keeping it simple. I wouldn’t know what to bring because I would want to bring everything! What shoes did you bring? Good thing is, I’ve gotten accustom to buying things abroad. Visiting the local markets to buy your toiletry is far more fun than going to Walmart. Lol. I haven’t felt the need to shop (yet) so I think I’m ok. Though Gerard thinks 4 pairs of shoes is excessive. Haha. I don’t care. Great list!! 🙂 Hope you guys are loving nz. I just got back from my trip in Asia and now taking it easy in Chch.. 🙂 Have fun! Wow you two are inspirational! So much stuff into a carry on…IMPRESSIVE! that’s my next goal. downgrade my pack to a carry on size. Totally! 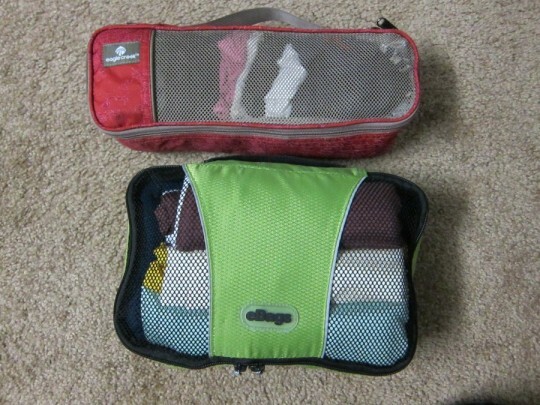 Packing cubes are the best!!! Plus it keeps things so organized and compact. Really does wonders for your carry on. Good luck! Love this list! We have less than a month to go before we set off on our 2 year trip so I;m definitely going to be comparing all the stuff I’m packing to this list! Amazing that all that fit into the backpack! Any idea how much everything weighed? Start out in Japan in less than 3 weeks — eeek coming up so soon! And then traveling through SK, China and South East Asia – so hoping we won’t need any heavy warm wintery items. Question — how did the lush shampoo bar work out for you (I notice it’s crossed off the list now) ? 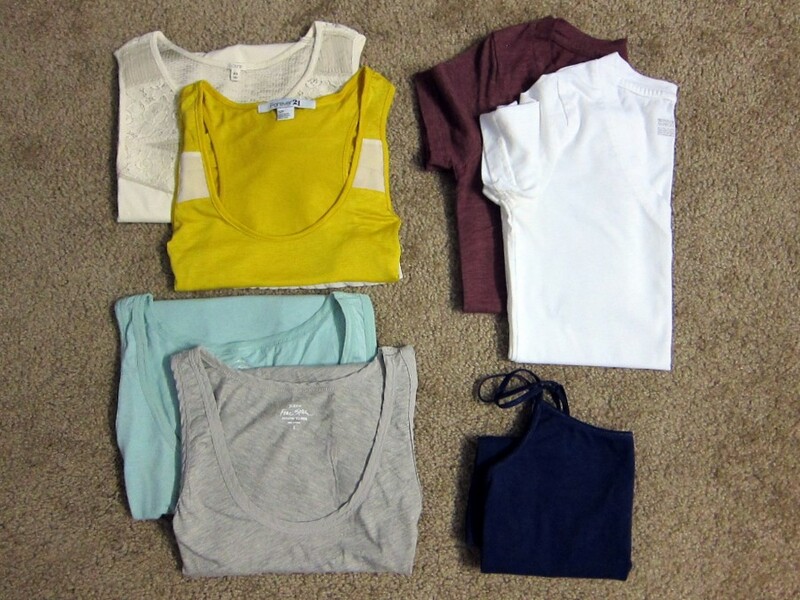 Great packing list! Question: With all of your toiletries, did you have to check-in your bag or were you able to carry it on for most airlines? I’m going to Peru for only 15 days in October and will be using your packing list a jump point for my own. Thanks and safe travels! Hey.. nope. All my toiletries are under 3oz or 100 ml and fit into one large plastic toiletry bag which makes it easy for me to pull out during security check in. A few times security ask me to take it out but once they saw they were all small bottles, I passed. The eBag Mother Lode TLS Weekender Convertible is awesome. That’s the same bag i use. 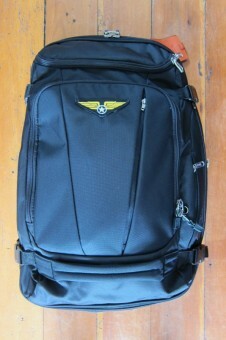 I wish it had a little bit more structure to it like G’s Osprey Porter 46 – that’s another great bag. Those other traditional HUGE backpacks are out – you gotta go with carryon size these days, in my opinion. The less i carry the less burden i have while travelling – physically and mentally. I know what you mean, it keeps collapsing on me when I try and pack. I don’t know how I’d survive with anything bigger. By far the best decision we made in terms of packing. Carry-on all the way! Now let’s see if I can do that for winter in Eastern Europe.. Oye vey..
Hope you’re both doing well, your site is amazing. Thanks Alex! Well all the airlines we’ve been on allow one carry-on and one personal item (like a purse or small bag as long as it fits underneath your seat). In our case, our daypack was our personal item. We stuffed pretty much all our electronics in there and it had no issues going on the plane with us. Hope that helps! 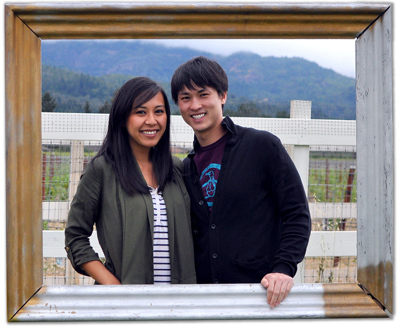 Hey Kieu and Gerald! I just wanted let you guys know that you both have been such an inspiration! I was wondering if you were to pack again, are there things you guys would leave out? or bring that you didn’t bring this time? Would really appreciate the input! Thanks guys! Definitely, there are things I wish we didn’t bring. In fact, I actually crossed them off the list above in the mean time, but planning on writing that post soon.. hopefully. They’re mostly small items like laundry sheets and sink plug. I didn’t need to bring more than I brought but if I needed an extra shirt or something, I was able to buy it on the road. It’s more fun that way too. Better to under pack and shop as you go then to over pack and dread tossing your belongings, I say. Hope that helps and thanks for trippin’ by. Really appreciate it. All the best! Definitely, there are things I wish we didn’t bring. In fact, I actually crossed them off the list above in the mean time, but planning on writing that post soon.. hopefully. They’re mostly small items like laundry sheets, my Toms, that extra bikini and sink plug. I didn’t need to bring more than I brought but if I needed an extra shirt or something, I was able to buy it on the road. It’s more fun that way too. Better to under pack and shop as you go then to over pack and dread tossing your belongings, I say. Hope that helps and thanks for trippin’ by. Really appreciate it. All the best! Hey Kieu and Gerard. I am planning my first 1 year RTW trip for next summer and I love your website. Q, your pack looks great and I am interested in it. Did you ever find it to be too big? At 54-60 liters, it seems like it might be too big. I know if I have the space, I’ll fill it! Were you always able to carry it on flights? How did you like the waist strap? Congrats on the engagement!! Hey Amy! Congrats on your decision for travel, yay! I do love my bag and it definitely passes for carry-on. That said, I hated the waist straps, so most of the weight was on my shoulders. Although the most I had to lug around was about 20lbs or less. Other than that, it’s a good bag, Organized. 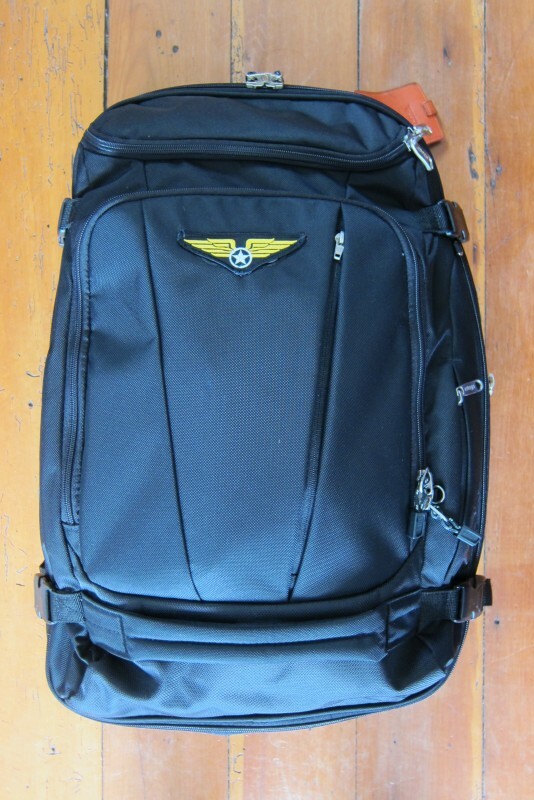 I’d also recommend you looking into Gerard’s pack, the Osprey. I like the Farpoint one with detachable dayback. Our friend Devon had that one and it looked cute. http://www.answeringoliver.com/2012/02/my-rtw-packing-list.html Good luck!